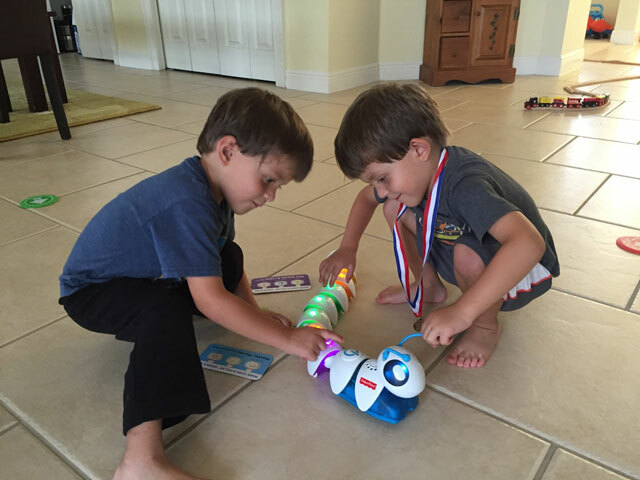 Knowing the importance of STEM in education and having a husband who is a programmer, I have been eager to start my twin preschool boys learn coding concepts, but I assumed they were too young to start. The Think & Learn Code-a-Pillar from Fisher-Price ($49.99 on Amazon) is a caterpillar that encourages kids to experiment and play while developing coding, sequencing and critical thinking skills — all before they reach school age. This learning toy is aimed for little minds ages 3 through 6. Best of all, it’s not tablet- or app-based either, thus, freeing parents from worry about the effects of screen time. 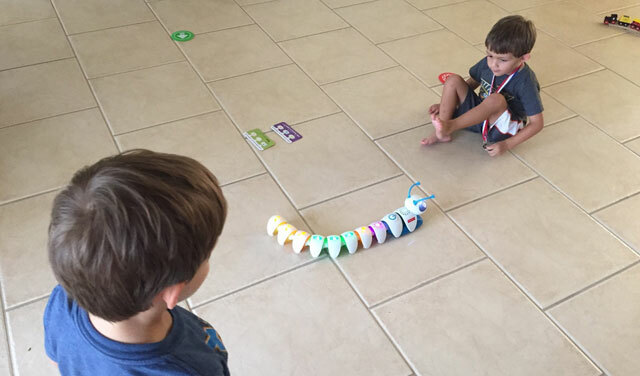 Preschoolers arrange the Code-a-Pillar’s easy-to-connect body pieces in endless combinations to send the robot on its path: forward, left, right or wait for a couple of seconds before moving again. Kids configure the segments to reach targets parents set up throughout the room. But what does that have to do with coding? When kids connect the segments to make the Code-a-Pillar move, that’s sequencing. When they figure out a sequence that creates a path to their target, that’s programming (and problem-solving, too). It’s all coding—and it’s all fun! My boys bounce and dance around to the music and squeal when the Code-a-Pillar pivots and moves towards them. While I’m not sure my three-year-old understand how order works, they are grasping the concepts of sequence and logic. They can see that the arrow makes it turn and the green straight arrow makes it go straight and that the piece with the speaker icon makes the Code-a-pillar play a tune. Now we are trying to show them how to place the pieces in such a way that it eventually reaches the included red target disc. They now get the goal and work with us to help get the device there. They do a better job at putting together the pieces of the body than I do. They also piece it together seamlessly and have no problem starting it, either. I was really surprised how much my kids enjoy this toy. In fact, they are addicted to it. It’s not the type of toy they play with for hours, but they do want to play with it daily and request that we bring it out of the closet for them. As a mom of multiples, it’s great to see that they can play with it together and enjoy having mom and dad play too—team-building! The Think & Learn Code-a-Pillar includes eight light-up segments, a motorized head segment with lights, sounds and blinking eyes, and two targets. Additional segment add-ons are sold separately, including the Silly Sounds & Lights (above) and Master Moves (below) expansion packs, priced at $15 on Fisher-Price.com. We look forward to expanding our bug. A free companion app just launched that enhances the learning fun, posing new challenges for the Code-a-Pillar that children have to plan and sequence. The app also covers overt learning like counting and patterning. Start a Code-a-Pillar journal. Ask kids to imagine Code-A-Pillar as a real caterpillar and think of the things they would do together. Next, ask them to write down or draw a story about their adventures with Code-A-Pillar. Don’t forget to plan how you’ll make Code-A-Pillar go! Have your adventurers draw a map of all the places they and Code-A-Pillar visit together. Build an obstacle course for Code-a-Pillar. Help your map makers draw an obstacle course on paper — just like drawing a treasure map! Then arrange the obstacles around the floor. Place Code-a-Pillar on the start target. How can he get to his finish target? Suggest trying a few segments at a time to see if your children can figure out how each one works. Use a ruler or measuring tape to measure how far Code-a-Pillar traveled! If Code-a-Pillar takes wrong turns, what segments do you need to change? Make up a game together. Draw pictures of Code-a-Pillar’s pieces on index cards, using one segment symbol for each card. Place the cards face down in a pile. Next, place the start and finish targets on the floor. Make sure you space them out so Code-a-Pillar has room to move. Now take turns picking index cards from the pile and connecting the matching segment to Code-a-Pillar. Place Code-a-Pillar on the start target, press his button and watch him go. The first person to get Code-a-Pillar from start to finish wins. I found this interesting and reposted it to my FaceBook Group: ThoughtCrafting, as an interesting toy to help foster creative thinking in children. (https://www.facebook.com/groups/1209168675769765/ - feel free to join the discussion on Improving your thinking processes).